Bernard Quaritch was born in a village outside Göttingen, Germany. After first working for booksellers in Nordhausen and Berlin, he travelled to London in 1842, carrying a letter of introduction to Henry Bohn, the leading London bookseller. Quaritch was employed by Bohn until, in 1847, he set up his own business. Quaritch built up his business with an impressive clientele including those in this archive. He became lifelong friends with Edward Fitzgerald and published his translation of The Rubáiyát of Omar Khayyám in 1859. He continued in business until his death in 1899, when the business passed to his son, Bernard Alfred Quaritch. For a more indepth biography see Bernard Quaritch Ltd: Our History. Horace Hayman Wilson – an English orientalist, interested in the language and literature of India. In 1811 he was appointed as Secretary to the Asiatic Society of Bengal. In 1813 he published the first Sanskrit-English dictionary, and later, many other publications. He was an original member of the Royal Asiatic Society, of which he was director from 1837 until the time of his death. Wilson is buried in Kensal Green Cemetery. 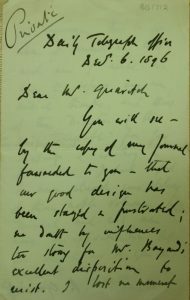 Letter from Horace Hayman Wilson to Bernard Quaritch to thank Quaritch for the copies of the Persian Grammar which he had presented to the India Office Library and to the Professor. Max Müller – a German-born philologist and Orientalist, a founder in the western academic field of Indian studies. He was born in Dessau and was educated in Leipzig. In 1850, he was appointed deputy Taylorian professor of modern European languages at Oxford University and in 1868 was made Oxford’s first Professor of Comparative Philology. “The Sacred Books of the East”, a 50-volume set of English translations, was prepared under his direction. He also promoted the idea of a Turanian family of languages. 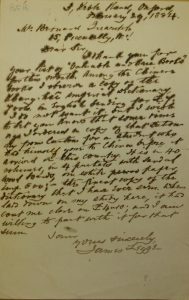 Letter from Max Müller to Bernard Quaritch in which he writes concerning Sanskrit grammars. Edward Fitzgerald – an English poet and writer, best known as the poet of the first and most famous English translation of The Rubáiyát of Omar Khayyám. He was born in Suffolk, lived part of his childhood in France, and attended Trinity College, Cambridge. He became a lifelong friend of Bernard Quaritch who published his the Rubáiyát of Omar Khayyám in 1857, at first anonymously. 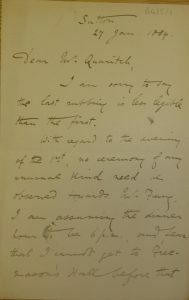 Letter from Edward Fitzgerald to Bernard Quaritch in which he asks that Quaritch will get someone else to do the proofreading as he finds it difficult to do. Sir Monier Monier-Williams – the second Boden Professor of Sanskrit at Oxford University, England. He studied, documented and taught Asian languages, especially Sanskrit, Persian and Hindustani. He was born in Mumbai, but educated in England. He taught at the East India Company College from 1844 until 1858. In 1860 he stood against Max Müller, and was appointed, for the position of Boden Chair of Sanskrit at Oxford University after the death of Horace Hayman Wilson. He was knighted in 1876. 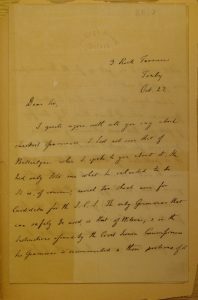 Letter from Sir Monier Monier-Williams to Bernard Quaritch in which he writes concerning the publication of his “Indian Wisdom”, published by W.H. Allen. Many copies have been subscribed for by the Indian Government but he can offer Quaritch 8 copies at 12/6 each, the same price as offered to the India Office. Herbert Allen Giles – a British diplomat and sinologist who was the professor of Chinese at Cambridge University for 35 years. Giles was educated at Charterhouse School before becoming a British diplomat in China from 1867-1892. He modified a Mandarin Chinese romanisation system established by Thomas Wade, resulting in the widely known Wade–Giles Chinese romanisation system. Among his many works were translations of the Analects of Confucius, the Lao Tzu (Tao Te Ching), the Chuang Tzu, and, in 1892, A Chinese-English Dictionary. 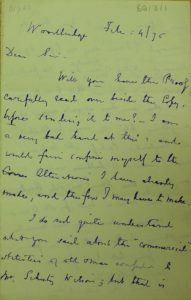 Letter from Herbert Allen Giles to Bernard Quaritch in which he writes concerning a dinner for W. Fang which he assumes will be at 6pm. He would not be able to get to the Freemasons Hall before that time. James Legge – a Scottish sinologist, missionary, and scholar, best known as an early and prolific translator of Classical Chinese texts into English. Legge served as a representative of the London Missionary Society in Malacca and Hong Kong (1840–1873) and was the first Professor of Chinese at Oxford University (1876–1897). 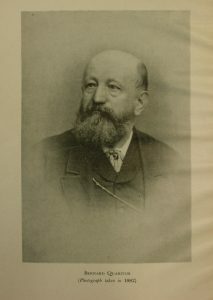 In association with Max Müller he prepared the Sacred Books of the East series, published in 50 volumes between 1879 and 1891. 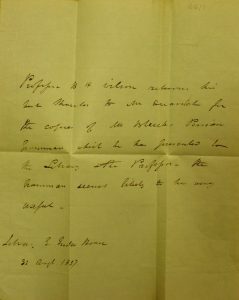 Letter from James Legge to Bernard Quaritch to thank him for the list of books that Quaritch had sent and to tell him about an impressive copy of the Shanghai Imperial Dictionary which he had seen. Edwin Arnold – an English poet and journalist. He was born in Gravesend, Kent, and educated in Rochester and Oxford before becoming a schoolmaster in Birmingham. In 1856 he went to India as Principal of the Government Sanskrit College at Poona. He returned to England in 1861 and worked as a journalist for the Daily Telegraph. He was best known as a poet and specifically for interpreting Eastern philosophy and life in English verse. His chief work with this object is “The Light of Asia”, or “The Great Renunciation”, a poem of eight books in blank verse. 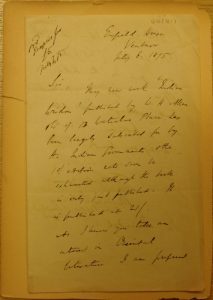 Letter from Edwin Arnold to Bernard Quaritch in which he writes on behalf of himself and the Directors of the Daily Telegraph to thank Quaritch for his kindness and courtesy. He writes that “little-minded and evil men have disappointed me”. Ernest Satow – an exceptional linguist, an energetic traveller, a writer of travel guidebooks, a dictionary compiler, a mountaineer, a keen botanist, and a major collector of Japanese books and manuscripts on all kinds of subjects. He served in Japan and China as a diplomat and was Britain’s second plenipotentiary at the Second Hague Peace Conference. 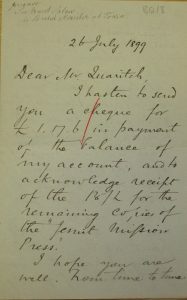 Letter from Ernest Satow to Bernard Quaritch with which he is sending a cheque to cover his outstanding balance with the bookseller. He writes that Quaritch has a very interesting Japan catalogue and that he may have to buy some of them.